The purpose of this letter is to give a factual summary of the compliance or otherwise with the calling and holding of elections under the Constitution between 1997 and 2015. But before I do so, I have to express some sorrow for Yolanda Ward, Public Relations Officer (PRO) of the Guyana Elections Commission, who in responding to a letter by a former Deputy Chief Election Officer, showed how much she has eaten her own words and has become part of the incompetence, duplicity and subservience of GECOM under James Patterson, the unconstitutionally imposed Chairman of a perennially divided GECOM. I set out a history of the critical dates of those elections from information sourced from the records of the National Assembly below. (E) represents the number of days between the dissolution of Parliament and the date of elections. The Constitution is very clear about the holding of elections: they must be held within three months of every dissolution of the Parliament “as the President shall appoint by proclamation” (Article 61). This is regardless of the cause of elections, including a vote of no confidence. With the exception of the 2006 elections, all the elections were held within the constitutionally mandated three months. So the call by GECOM that it requires a minimum period of 148 days to hold elections, is an admission of the grossest incompetence among GECOM Commissioners ever and the inability of the current lot to carry out their constitutional duty. There is a coincidence of the three months mandate. The GECOM people seem to want to give the impression that the three months deadline for the holding of elections under Article 106 (7) of the Constitution following the no confidence vote is a curtailment of the normal period. It is not. Rather it is the normal and ordinary period. Apart from the Constitution, there is the Representation of the People Act which sets some timelines regarding matters of details such as the period between nomination and elections, etc. After some considerable research and with help from two sources, I have managed to piece together some details in respect of the one month delay in the holding of 2006 elections, an issue taken up by the TUC in reference to what is now taking place. There were in fact two pieces of legislation, Acts 12 and 24 of 2006, both assented to on the same day that Parliament was dissolved, i.e. 2 May 2006, having been passed with the undivided support of the PNC-R, then in Opposition. Act 12 of 2006 made several amendments to the Representation of the People Act and the Election Law (Amendment) Act 0f 2000, including those made necessary by the introduction of continuous registration, substituting registration record for registration card, and a deadline by which results must be declared. On the other hand, Act 24 of 2006, titled the Constitution (Amendment) Act 2006, had one single amendment as follows: “In relation to the Eighth Parliament, article 61 shall have effect as if for the words ‘three months’ the words ‘four months’ were substituted.” In other words, in the heat of a crime wave, and with numerous amendments to the two main election laws, only a one month extension was needed by GECOM for the holding of elections. The then opposition commissioners on GECOM at the time were Robert Williams, Lloyd Joseph and Haslyn Parris. But the commissioners were not the only difference. Compare the present illegitimate James Patterson with then Chairman Steve Surujbally, and the latter’s team of competent people with the current lot. Taxpayers should recoil and rebel at this hopelessly incompetent bunch being given $5,400 million to spend in 2019 and still asking for more. 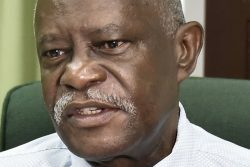 In any case, no matter how Granger, Patterson and the Government members of GECOM may wish to spin it, they will all be in violation of the Constitution come March 21, 2019.